LOOBANI Bath Seal is a pre-adhesive plastic strip which bonds to the wall to form a completely watertight seal. The rigid strip has rubbery edges that mold the strip to the contour of each tile and grout line it covers. Magic Bath Seal provides a moisture barrier that closes gaps and seals water away from surfaces. An easy-to-use alternative to caulk between the tub and wall. Simply press into place to eliminate leaks and never caulk again. ✔️ High-Quality Material: Made of high-quality PE material,features stronger stickiness and adhesion than traditional PVC. Environmentally friendly and non-toxic. ✔️ Long Lasting: This Bath Sealant Strip provides a water tight seal, Ideal for baths and sinks. Lasting for a long using time. 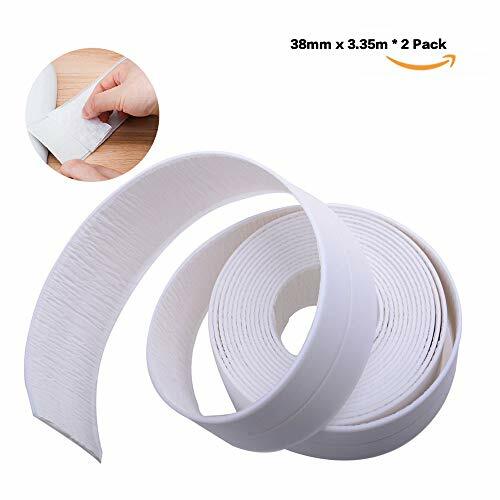 ✔️ Widely Use: Great for sealing the seams of gas stove, sink, basin, bathtub and walls, it could prevent them from getting mouldy and black, keep your kitchen and bathroom clean and tidy.